Whether you’re a new hot tub owner or a spa master, your first priority after starting a hot tub is probably going to be how to heat a hot tub. After all, a hot tub with no heat is just a tub. How you heat it depends on your hot tub’s condition, efficiency, and location. Good things may come to those who wait, but we say it’s no fun waiting longer than necessary. Every hot tub is different, but you can find ways to get your tub a-bubblin’ quickly with the right techniques, regular maintenance, and a few strategic upgrades. Seriously—How Long Does It Take to Heat a Hot Tub? If it’s working properly, the heater in your spa will usually heat the water at a rate of 3°F–6°F (2°C–3°C) per hour. Were you looking for a longer, more complicated answer? Nope. That’s it. 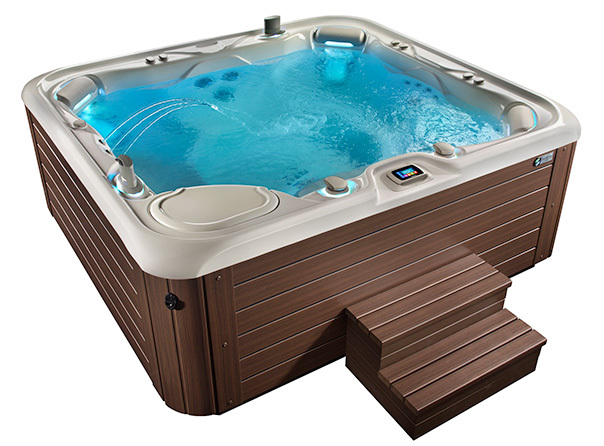 The warmer the water and surrounding air, the less time your hot tub will need to heat to the proper temperature. What’s the proper temperature? For adults, health experts suggest that 104°F (40°C) is the upper limit for how hot a hot tub should be. You’ll probably find your spa is most comfortable somewhere between 100°F (38°C) and 102°F (39°C). For example, let’s say it’s 76°F (24°C) outside, and your water is at the same temperature. Heating your hot tub to 100°F (38°C) will take around 4–8 hours. If, on the other hand, it’s a frosty 52°F (11°C) outside, and your water is the same temperature, then you’ll need 8–16 hours to reach 100°F (38°C). PRO TIP: As the temperature climbs, monitor it with a floating spa thermometer. Compare the readings with your system temperature to make sure the thermometer built into your hot tub control panel works properly.